This is a sponsored conversation written by me on behalf of SweeTARTS. The opinions and text are all mine. 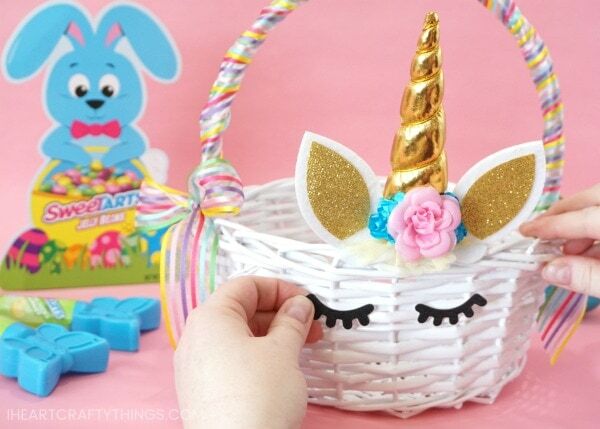 We hope you and your children enjoy this darling DIY Unicorn Easter Basket this year. If my daughter could have one wish granted I’m certain it would be for her to have a real life unicorn. Do you know someone with this wish too? As much as I want to grant that wish for her, I can’t, so I did the next best thing. 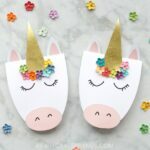 I made her this darling DIY Unicorn Easter basket as a special Easter surprise. She may not be riding around on a unicorn on Easter morning but she will be collecting her Easter eggs in style with her darling unicorn basket. 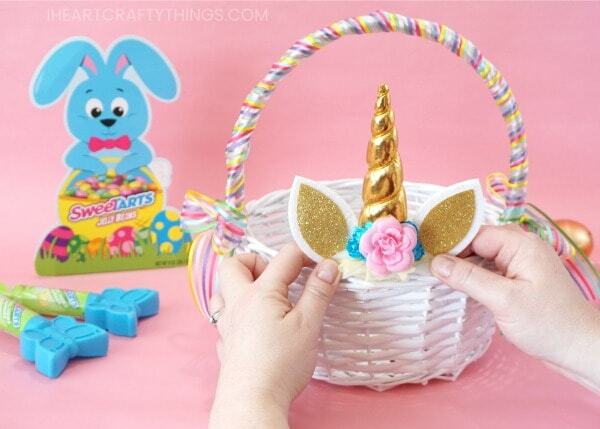 This beautiful DIY Easter basket is sure to thrill any unicorn fan. Best of all, it is super simple to create. Even beginning crafters can put it together easily. 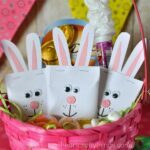 Grab the supplies you need, along with some delicious SweeTARTS candy for filling the basket, and you will have this DIY Unicorn Easter basket finished and ready for Easter morning in no time at all. NOTE: You can get the Unicorn Cake Topper on Amazon! 1. Heat up your hot glue gun. Add some hot glue at the bottom of one side of the handle and attach the end of your ribbon to it. 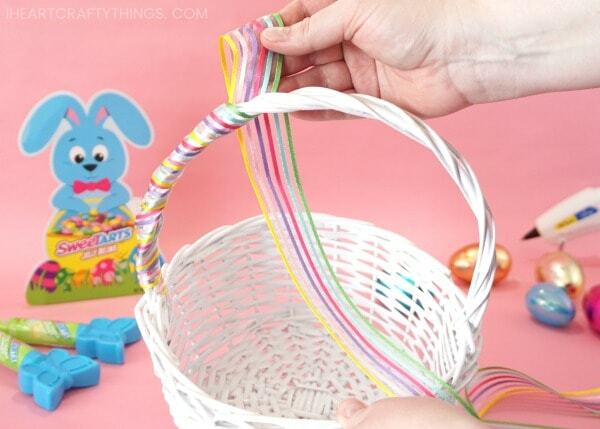 Wrap the ribbon around the handle of the basket and continue until you reach the opposite end of the the handle. Add more hot glue at the end of the handle and attach the ribbon to it. 2. Use scissors to cut off any excess ribbon at the end of the handle. 3. Tie two bows out of your rainbow ribbon. Hot glue a bow on each side of the basket handle. 4. Add hot glue to the bottom of the unicorn horn and ears piece and attach it to the front of the Easter basket. 5. 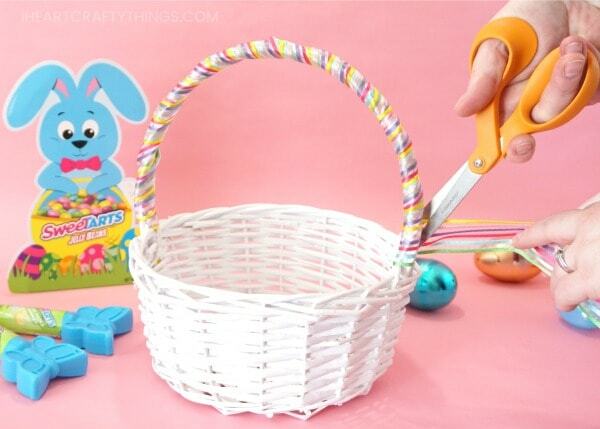 Use hot glue or glue dots to attach the eyelashes from the cake decorating kit onto the front of the Easter basket. 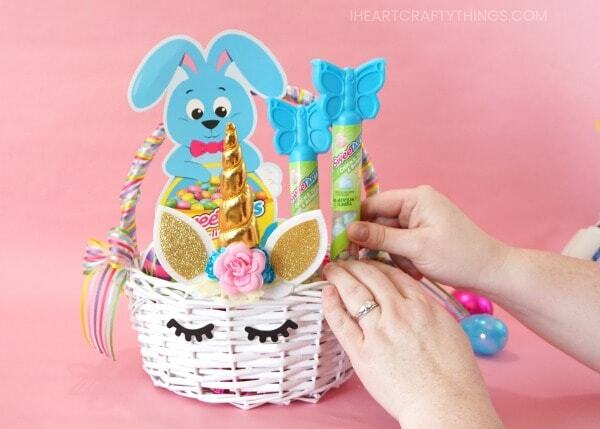 Your DIY Unicorn Easter Basket is complete! 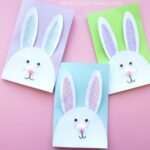 Add some paper filler to the bottom of your unicorn Easter basket. 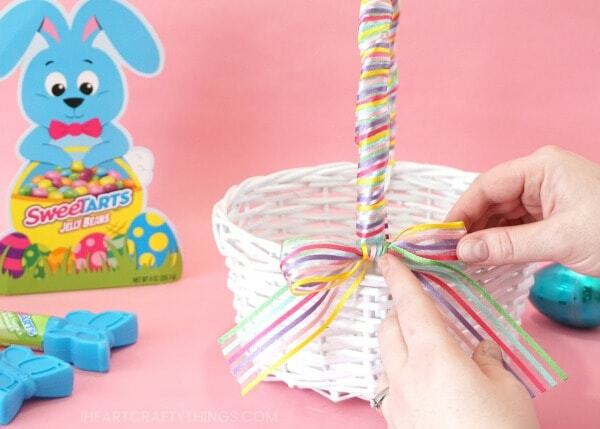 Then place a SweeTARTS Jelly Beans Bunny Shaped Box inside the basket. 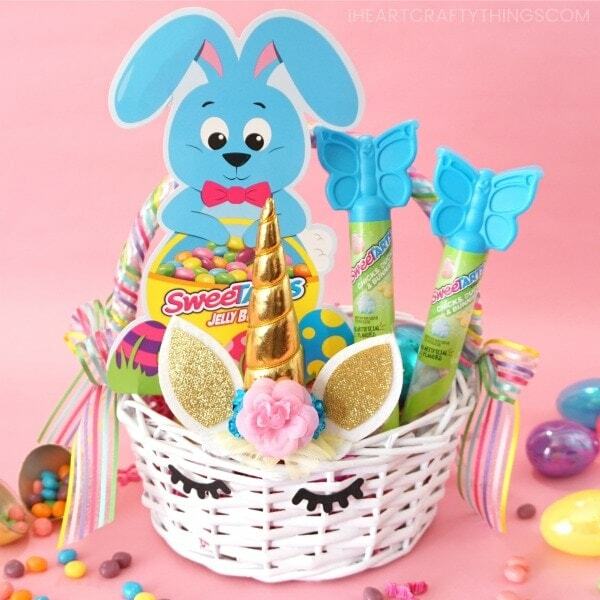 It makes the perfect colorful centerpiece to complete your pretty Unicorn Easter basket. The scrumptious SweeTARTS Jelly Beans have the original flavor combination of Sweet and Tart in a juicy, chewy jelly bean. They are delicious! The SweeTARTS Chicks, Ducks & Bunnies Topper is another tasty treat that comes in cuter than cute shapes and makes a great Easter basket stuffer. I adore how they are free of artificial flavors. You can find both of these SweeTARTS products at any major retailer nationwide. 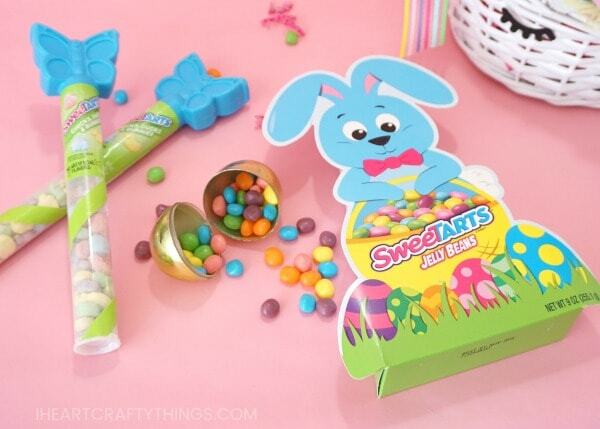 Surround the SweeTARTS candy with some colorful plastic Easter eggs filled with other surprises inside the basket. You now have a beautiful Easter basket ready to impress your little unicorn fan on Easter morning.